The CE690 is a DVI Optical KVM Extender that overcomes the length restrictions of standard DVI cables by using fiber optics to send high definition audio, video and control signals over long distances. 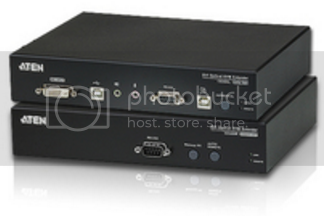 The CE690 can transmit KVM DVI signals extremely long distances - up to 20 km away from the source. The extender takes audio/video streams from the local source and serializes the data to pass it over a single 3.125 Gbps optical link, for resolutions up to 1920 x 1200 @ 60Hz, 24-bits, with picture perfect quality.